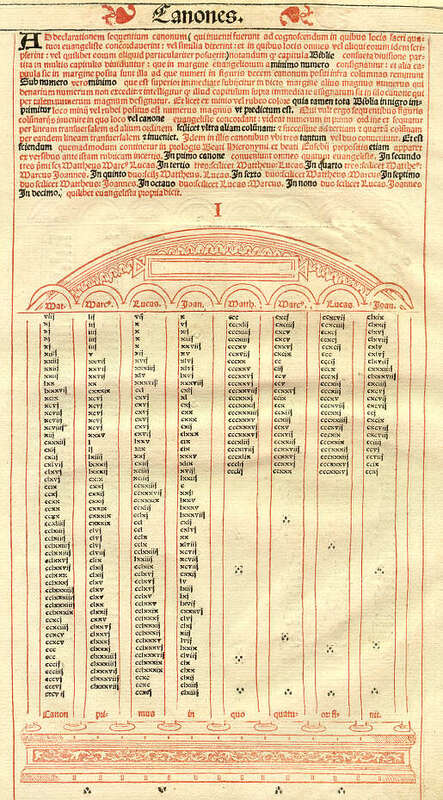 The text at the top of this page explains how the Eusebian Canon works. It is part of a letter written by Eusebius to his friend Carpianus, and was usually included with the Canon. It's in Latin, so unless you are an old Roman, forget trying to read the text. Canon primus in quo quatuor finit. Could you imagine typesetting this page by hand? All those little X's, I's, and C's. It's more tedious than I would like to undertake.